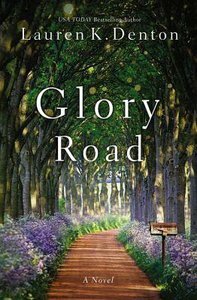 Written in Lauren Denton's signature Southern style, Glory Road tells the story of three generations of women navigating the uncertain pathways of their hearts during a summer that promises to bring change-whether they're ready for it or not. Meanwhile, Jessie's fourteen-year-old daughter, Evan, is approaching the start of high school and trying to navigate a new world of identity and emotions-particularly as they relate to the cute new guy who's moved in just down the road. At the same time, Jessie's mother, Gus, increasingly finds herself forgetful and faces a potentially frightening future. As all three women navigate the uncertain paths of their hearts and futures, one summer promises to bring change-whether they're ready for it or not. Customer Reviews For "Glory Road"
I admit it. I was captured by the beautiful cover, but this gentle contemporary Southern story touched my heart. Glory Road is a slow burn. Three generations of women, each experiencing life changes. Each chapter from the point of view of one of the characters: Evan, the teenage daughter; Jessie the divorced mum, and Gus, the grandmother. Reading Glory Road is like being dipped in warm molasses. Gentle, but the author dealt with real life issues. Bonus appeal for garden lovers. Not overtly Christian, but a good truth was communicated and it was a lovely clean read. I will definitely read more by this author.